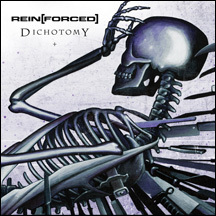 Dichotomy is the first single from the highly anticipated Rein[Forced] album X Amount of Stab Wounds in the Back. This digital only single features 6 versions of the title track including mixes by Stiff Valentine, Sensuous Enemy, Ego Likeness, Deathproof and The Dark Clan plus a special b-side. If this is any indication, then the album is going to be stellar.